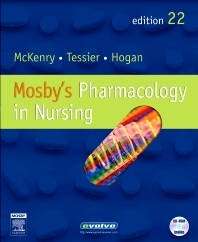 Mosby's Pharmacology in Nursing is the classic pharmacology text now made even better. Known for its comprehensive coverage of nursing pharmacology, the 22nd edition retains the strong nursing focus but now features a new student-friendly look in a case-study format to help students apply pharmacology concepts to real-world practice. Nursing process discussions include assessment, nursing diagnosis, planning, implementation and evaluation. Nursing care plans for selected drug groups illustrate the application of relevant nursing diagnoses, corresponding outcome criteria, and nursing interventions. Separate Disorders Index alphabetically references disorders in the text to aid in integrating the text with medical-surgical nursing course content. Drug reference tables summarize key pharmacologic information (mechanism of action, pharmacokinetics, dosages, etc.) and enhance the text's utility as a reference. Critical Thinking Questions at the end of each chapter help to reinforce key concepts; answer guidelines are included on the Evolve website. Provides pronunciation guides for generic drug names followed by U.S. and Canadian trade names. Canadian trade names are highlighted with a maple-leaf icon. Comprehensive index includes entries for every trade name, followed by the generic name in parentheses. Page numbers for drug monographs are highlighted in bold type. Highlights include Special Considerations for Children and Special Consideration for Older Adults boxes, Management of Drug Overdoses boxes, Cultural Considerations boxes, Pregnancy Safety boxes, Technology Link boxes, Complementary and Alternative Therapies boxes, and Community and Home Health Considerations boxes.